Sen. Cory Booker, seen as a likely contender for the 2020 Democratic presidential nomination, appears in a photo appearing to endorse a slogan of an anti-Israel movement. Booker, a New Jersey Democrat who is known for his closeness to the Jewish community, is seen posing while holding a sign reading "From Palestine to Mexico, all the walls have got to go" and depicting a crumbling brick wall. The slogan was coined by the US Campaign for Palestinian Rights, which posted the photo Friday on Twitter. The sign likens US President Donald Trump's Mexican wall proposal to Israel's security barrier. JTA's requests for comment from Booker's Senate office were unanswered. The Twitter post said the photo, in which Booker poses with three other people, was taken at the Netroots Nation conference taking place this week in New Orleans. Booker is shown posing with Leah Muskin-Pierret, the government affairs associate of the US Campaign for Palestinian Rights, a group that endorses the Boycott, Divestment and Sanctions (BDS) movement targeting Israel. She is shown wearing a shirt with a pro-Palestinian Authority (PA) slogan. "Excited to be here at Netroots Nation talking with progressives like Sen. Cory Booker about our shared commitment to freedom, justice, and equality for all people," the Twitter post said. Netroots Nation is an annual conference for "progressives." Supporters of Israel reject the comparison of the Israeli security barrier -- which they point out virtually ended terrorist attacks within pre-1967 Israel -- to a wall on the Mexican border largely seen as a bid to stop immigration overall. 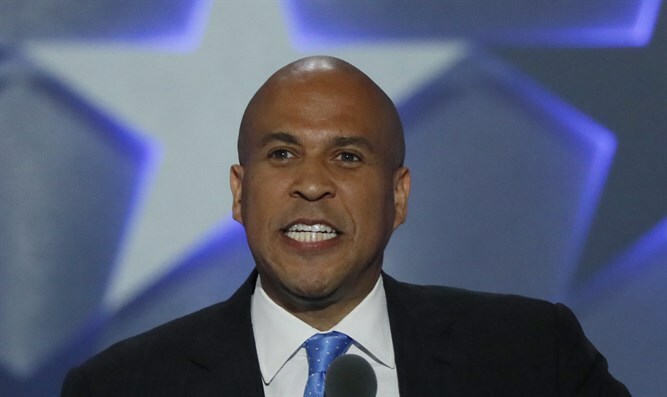 Booker, the former mayor of Newark, New Jersey, has for years been a favorite speaker at Jewish and pro-Israel groups. He has studied Jewish texts since joining the L'Chaim Society while attending Oxford University. In 2015, the founder of the L'Chaim Society, Rabbi Shmuley Boteach, broke with Booker over his support for the Iran nuclear deal. In July, Booker urged colleagues to continue funding security assistance to Israel. “Ending security assistance to our closest ally in the Middle East at a time when Israel faces new threats emanating from Syria and continued aggression from Iran and its proxies would undermine stability in the region and harm our own national security," he said at the time. "The United States and Israel have a history of unprecedented cooperation on the basis of shared ideals and democratic principles. [Curtailing funding] would dramatically undermine our enduring commitment to Israel’s security and the historic ties between our two nations, jeopardizing a peaceful and stable future."